Creating Life in Colour: Have you seen Purple Pumpkin? Have you seen Purple Pumpkin? I've only just discovered Purple Pumpkin and their gorgeous range of embellishments in the last couple of months. Last month was my first order and i was most impressed with service, delivery and the products themselves!! I've used them already on a few LO's - including at least one of my masters entries!!! July marks the first birthday of Purple Pumpkin, so they are having a HUGE giveaway. Go to the blog to check out how you can enter, and don't forget to check out their amazing range of embellies while you are there!!! I'm sooooo looking forward to their next sale towards the end of the month. The winners of their giveaway will be announced 22nd July - right before the next sale. Wouldn't it be nice to win $50, $25, $15 or $10 towards an order at their next sale!!!! Overall i’ve been quite disappointed working with Noro this year. I’ve had Noro envy for so long now and once i started working with it i’ve not enjoyed it like i should. I will certainally not be knitting socks or garments with it again. 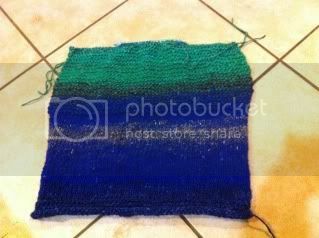 I’d like to give it a final try with a lace stole or something where the colourings don’t matter so much. 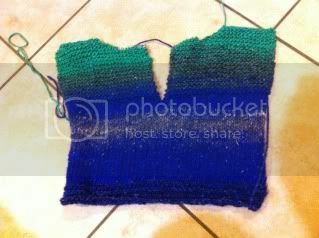 But, this sort of project is pretty low on my ‘to knit’ list, so i probably won’t get it done any time soon. Where does your camera live?